There's so much happening in the beautiful Macedon Ranges this Spring, it's the perfect time to get out and enjoy some gorgeous sunshine, and why not pop along to our Springtime Market in Woodend on 11 September! There'll be goodie bags to the first 100 through the door, yummy cupcakes and delicious coffee, and of course, FREE face painting for the kiddies! Our fab face painting friends at Pass-The-Parcel are busy with the Kyneton Daffodil Festival, so we have a wonderful new face painting business on board for our September market... Let us introduce you to Colour FX! 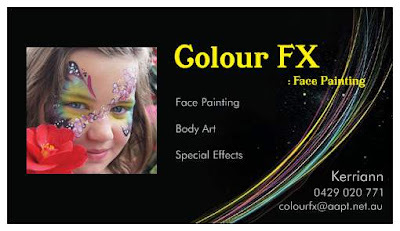 Kerriann, face painter extraordinaire, is the creator of Colour FX and a mum of two. 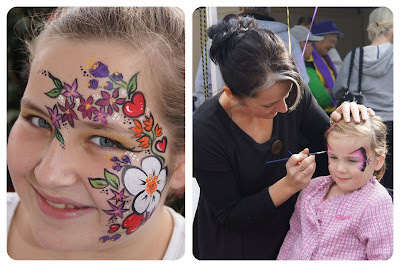 Happy to travel to your function, Kerriann is skilled at providing face painting, body art and special effects for all sorts of events and themes, including birthdays, fundraisers, community and corporate events, markets YAY!, and even nightclubs! Her designs not only cater for children, but also the young at heart. Kerriann promises to splash a bit of colour around our lovely Springtime Market, so prepare yourself for some wonderful creativity, a great deal of fun, and loads of smiling painted faces!